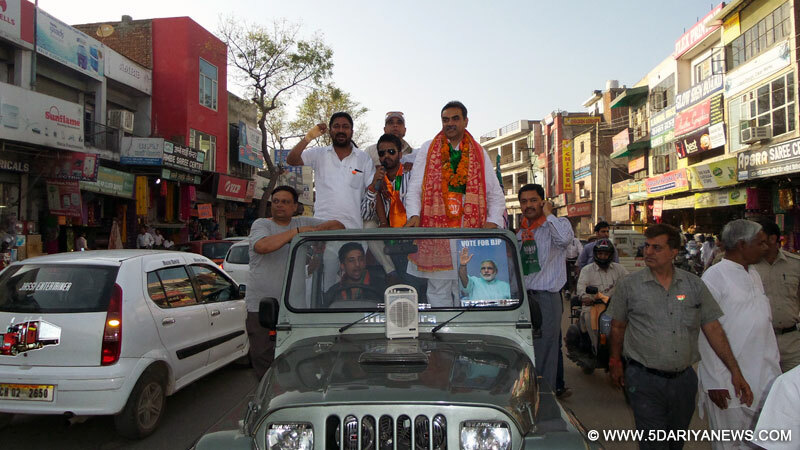 In the support of the Bharatiya Janata Party’s MP candidate, Kirron Kher, the BJP’s State President, Sanjay Tandon carried out a spectacular road-show in Manimajra. The caravan of the road show began its campaign from housing Board and travelled to Gobindpura, Modern Complex, Shanti Nagar, Madiwala town, Samadhi Gate, Main Bazaar, Dispensary, Rehri Market, Mori gate, Jattanwal Mohalla.While connecting with the common man, Sanjay Tandon said, “The sitting Congress MP has failed to fulfill the basic needs of the common man. If you come to Manimajra then you will find an utter state of neglect at various places when it comes to hygiene and cleanliness. The road infrastructure is poor and the condition of the Motor market is worst. The businessmen of this market have sent endless complaints and memorandums for the up-gradation of the market area. Nothing has been done in this regard so far by the ruling party”. Appealing to the local populace, Tandon said, “You will have to come out of your comfort zone on April 10 if you are looking for change. For bringing development, vote for BJP’s MP candidate, Kirron Kher”.On this occasion, BJP’s Mandal No. 25 President Rakesh Kumar Noni, District President, Shakti Parkash Devshali, General Secretary, State Yuva Morcha, Jagtar Jagga, Sports cell, Secretary, Swaran Singh, Sanyukat Beopar Mandal’s Chairman, Naresh Kumar Panna were present.